Why is OPC proposing this demonstration project? The problem, as we see it, is that most lakes and ponds on the Cape are impaired. There are limited options for remediation. Choice is constrained by costs, limited efficacy, and high regulatory approval thresholds. The vast majority of fresh and marine water bodies will never qualify for any kind of public funding. In the Commonwealth, the DEP remediation toolbox has not added a new technology in decades. 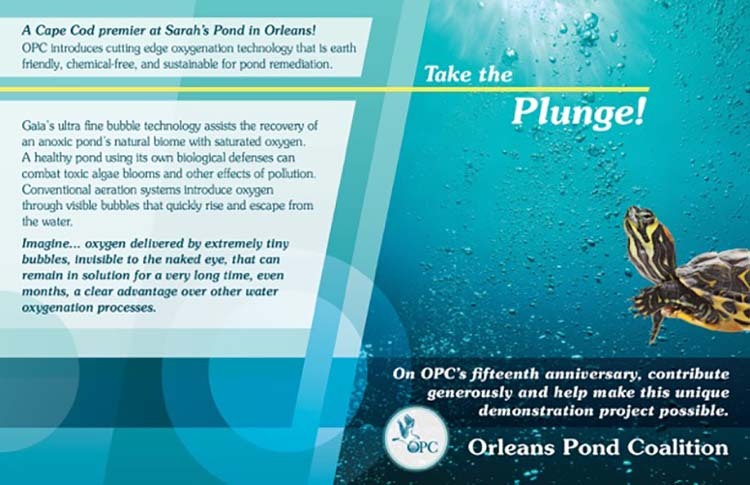 OPC wants to learn if it is possible to introduce a new technology that could be effective and affordable, a potential option for many kinds and sizes of private and public lakes and ponds, both freshwater and marine. Why do we want to add dissolved oxygen into Sarah's Pond? Dissolved oxygen (DO) is one of the most important factors dictating the water quality of lakes and ponds. A pond or lake is considered impaired when oxygen levels fall below 5 mg/L. At those levels, blooms of toxic algal forms such as cyanobacteria can occur, presenting significant health issues to humans and wildlife. Oxygen levels eventually can reach a point where no life is possible. Fish and other organism die. What are the traditional ways of introducing oxygen into a pond? There are many aeration methods and products on the market. Some common types are fountains, bottom diffusers, floating surface aerators, and paddlewheel aerators that bubble surrounding air into the water. Because most bubbles quickly rise to the surface and burst, these conventional aeration products are very limited in the amount of dissolved oxygen they can get into the water. Some systems can stir up bottom sediments, releasing excessive nutrients into the water column and increasing the dissolved oxygen needs of the water body. Why do ultrafine oxygenated bubbles work better? A new technology has been developed that uses oxygen generators to inject 90-95% pure oxygen into the water. More importantly, the ultra fine bubbles (UFBs) are so small (less than 0.1 micron in diameter) that they go directly into solution as dissolved oxygen rather than rise to the surface. These UFBs are directed across the pond bottom where oxygen is most needed. UFBs have a high negative charge and are highly pressurized. Because of these properties, they move horizontally in the water and remain stable in solution for long periods. Independent testing found oxygenation gas transfer efficiency to be over 90%, increasing critical dissolved oxygen levels in water bodies much more rapidly and to much higher concentrations than other aeration products. Sarah’s Pond is a 5.8-acre pond with two basins. By using the UFB oxygenation system in the east basin and keeping the west basin as a control, we hope to measure differences in water quality, such as improved oxygen levels, water clarity, suppression of algal blooms and improvement of the pond’s natural biome. UFB oxygenation may even inhibit phosphorus release from sediments, suppressing this internal nutrient source. Will it cause any harm? UFB technology is now widely used in many applications, including agriculture and aquaculture. There has been no evidence from current users interviewed by OPC of harm to wildlife. Fish and other life forms thrive in oxygen-rich environments. Will it be accepted as a remediation process by Mass Department of Environmental Protection? Although this oxygenation technology is new in MA, it is expected to require the same lower-level-permitting-clearance as any other aeration methodology currently on the MDEP books. OPC is experiencing upfront consulting costs of $10k which will be higher than they will be for subsequent applications, because UFB is new in Massachusetts. Under a proposed contract with SOLitude Lake Management, costs for equipment, installation and 2-year support will be around $32k. OPC will incur additional costs of $3 - $4k for unit housing and electrical connections. Monthly operating costs will be about $30. “Affordable” is a relative term. Who is our technical advisor? 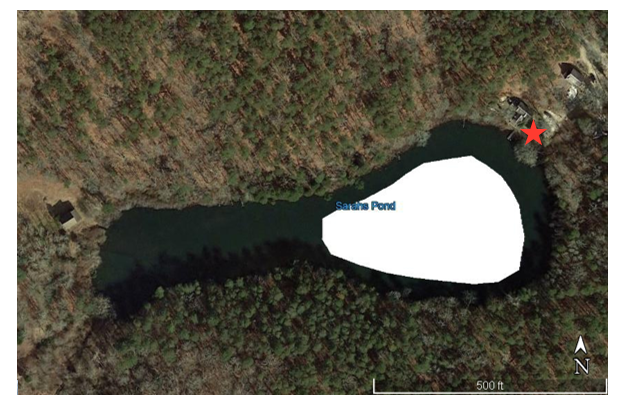 Diagram of Sarah’s Pond with eastern bowl demonstration area outlined in white. Red star indicates shoreline equipment location. OPC has contracted with Dr. Kenneth Wagner, the noted limnologist with over 40 years experience who has specified a pre-demo water quality monitoring program and has developed the oxygen demand targets for the project. What is OPC's current project timeline? 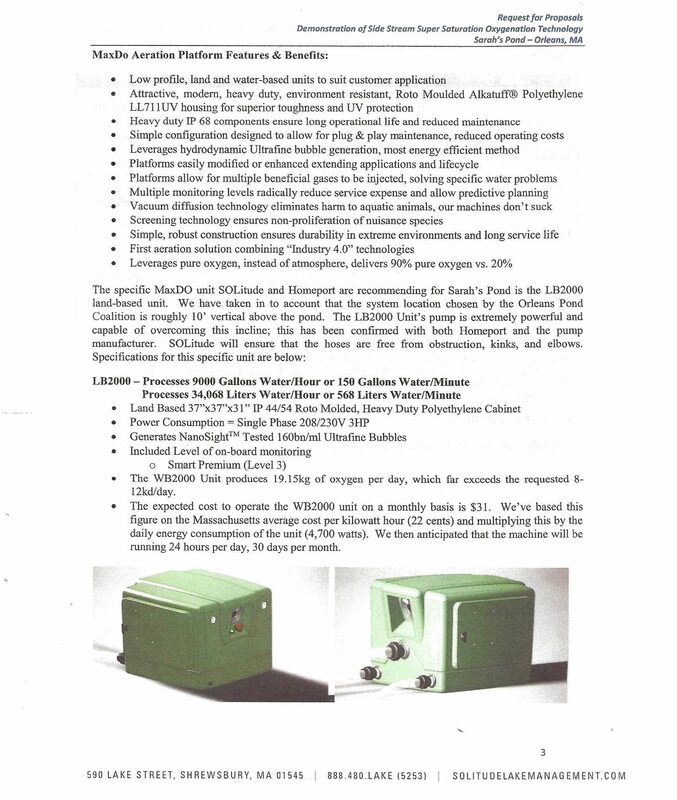 Using Dr. Wagner’s dissolved oxygen demand targets for Sarah’s Pond, OPC solicited bids from contractors in September and has chosen Homeport and its partner SOLitude as our contractors. On November 6, OPC will seek permission from the Orleans Conservation Commission to proceed with the project. Assuming Commission approval, the demonstration project will begin in early May 2019. One season of data will not be sufficient to determine success or failure of the project, but will provide enough information to determine next steps in the process. What equipment has been proposed? Homeport manufactures the MaxDo Aeration Platform LB2000 which is capable of producing up to 19 kg of oxygen per day (above our oxygen target), processing 9000 gallons of water/hour with a single phase 208 230V 3 HP pump. It has a seasonal projected monthly operating costs of $31 and a modest footprint of 37”x37”x31”. Details below.